One of Ivanhoe’s best-loved characters is Mr Baird, who delivers groceries to the General Store in Ivanhoe as well as door-to-door deliveries of meat orders. The fact that the locals refer to him as Mr Baird (never Bill) shows the respect that they have for this gentleman of the Bush. Mr Baird’s good friend, Loma Marshall lives up the road at Mossgiel where he would regularly stop for lunch on his way to Ivanhoe. Before the road was tarred, wet weather would see Loma running alongside Mr Baird’s truck so that he didn’t need to slow down (and get bogged) to get his lunch. I didn’t write these two articles but they tell their stories much better than I could. The articles were written by Sam Williams and published in the Daily Telegraph in January (2009) – photos by Nathan Edwards. MOST 92-year-olds would be sitting down in front of the TV getting comfortable in their warm socks. But an agile Bill Baird puts on his boots at 5.30am every day to deliver mail, groceries and milk to properties between Hay and Ivanhoe – a 420km round trip on the Cobb Highway. In his seventies, Mr Baird vowed he would retire from the job when he turned 80 – but that day came and passed and he still continues his run. “I keep doing it because it gives me something to get up for in the morning,” he said. While Mr Baird thinks his life’s been unremarkable, locals say he’s an icon and a great man who’s led a colourful life . . from his early milkman days when he gave away milk to those who couldn’t afford it because he believed kids should have milk, to being a POW of the Japanese. Everyone has a story about him but those on the Cobb Highway said he was a lifeline to town. 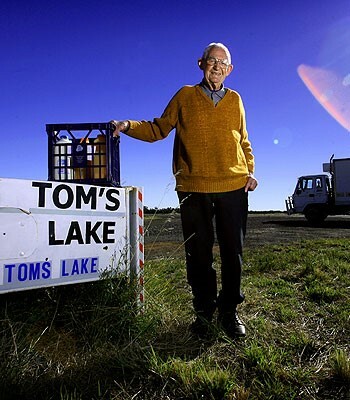 Mr Baird grew up on a dairy farm at Hay and worked for his father Tom, who had the milk run. “I never went to school in the depression because you didn’t have to go so I carried the milk on foot and would sell it for tuppence (twopence) a pint,” he said. He worked on the Thai railway and the day the atomic bomb was dropped on Hiroshima, he was 6km away digging for coal. He remembered: “When we came up everything was black . . . raining black soot and there was nothing left. We all got cancer,” he said. When he arrived home, he was ill and stick-thin – but determined to go back to his milk run. He has since driven through dust storms and floods so rural properties could get their mail and necessities. “I’ve seen kids grow up . . . towns come and go – but I wouldn’t change a thing,” he said. THERE was once a pub, a dozen shops, a racecourse, a hospital, a dance hall and a handful of homes. Now the only resident of Mossgiel is Loma Marshall, a retired drover who bought the old post office for $1500 in the 1970s. Mrs Marshall’s home, that sits on red dusty land at the edge of the Cobb Highway, is the only building that can be seen for kilometres. As she sits on a stool in her rustic kitchen flanked by four of her dogs, Mrs Marshall reflects on her life on the road as a drover. “They tell me I’m 80 but I think I’m 79 – numbers don’t matter out here,” Mrs Marshall said. “Over the years I’ve seen a lot of good and a lot of bad. I’ve had happy campfires and I’ve had sad ones. “But out on the road is where I wanted to be. She grew up on a farm but was too busy chasing wombats to go to school. 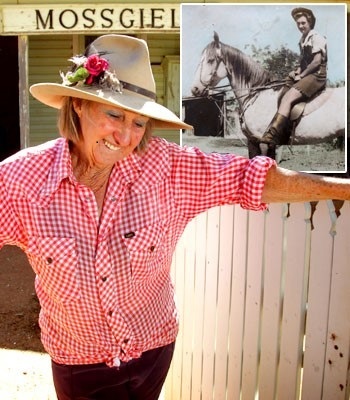 At the age of 14 she earned money breaking in horses but not long after took to the life of droving with a horse and wagon, moving cattle from Victoria to NSW. “It’s history no one wants to know about,” she said. Daughter Leonee Wright, a saddler in the town of Hay, said her mother was a part of the great Australian pioneering spirit, driving livestock in floods and droughts. Mrs Wright said her mother worked as hard as any man in a 24-hour job while raising two children and cooking on a makeshift stove on her own after her husband died in a truck crash. “Mum never thought she did much in life, but she is wrong,” Mrs Wright said. While Mrs Marshall said she wasn’t handy in the kitchen, Mrs Wright said her mother could cook anything with such limited resources. “When we didn’t have much money mum would whip up an amazing feed from a pigeon or rabbit my brother Bill or I had caught that day,” she said.